It goes without saying that first quarter GDP output, at -0.2, was plagued by several things, including bad winter to begin the year…again, which dinted consumer spending to a certain extent, coupled with what the Department of Commerce said was a deceleration in personal consumption expenditures (see consumer spending reference above), sluggish demand, and a strong U.S. dollar, too. Not to be overlooked, though, in the low Q1 GDP numbers is the effect of the West Coast port labor dispute, which, to a degree, is over, with the Pacific Maritime Association and the International Longshore and Warehouse Union ratifying a new deal in May, following months of disruption between the parties which, in turn, had a major impact of port throughput, congestion and operations, the country’s supply chain, and the economy, of course. Taking the West Coast port labor situation a step further in terms of its impact on first quarter economic growth or lack thereof, data from the Federal Reserve Bank of New York shows that the aftereffects of what was truly a tenuous situation at times truly weighed on U.S. economic growth. 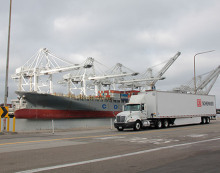 It also pointed out that West Coast ports’ imports and exports paid the price, with exports down 20.5 percent and imports off 9 percent in the first quarter, which were describe by the bank as substantially larger declines in comparison to previous quarters and steeper shipment declines than any other mode of transportation. Those declines were apparent to be sure based alone on the myriad supply chain-related issues experienced at West Coast ports, which saw many shippers re-routing cargo through East Coast ports, for example, and other related contingency plans to ensure products were in transit and on time and doing what was needed to minimize delays. All told, the Federal Reserve Bank of New York determined that the West Coast port labor disruption probably slowed Q1 real export growth by 1.5 percent, and in terms of the contribution to net exports to real GDP growth it would equate to a 0.2 percent decline in GDP. While a 0.2 percent decline in GDP appears to be minimal on the surface, it is pretty significant and had a deal not been reached at the West Coast ports, it very well could have been an ongoing issue in the coming months and quarters, but, fortunately, that is not the case. But at the same time that by no stretch means that challenges still remain. Now that the dust has somewhat settled out West, the question becomes: what happens now? Some of “what’s next” could be the shifting of at least some previous West Coast-bound cargo to the East Coast. That was made clear by maritime consultancy Hackett Associates Founder Ben Hackett in his editorial in the Port Tracker report he co-publishes with the National Retail Federation. Hackett explained that East Coast growth remains strong and is likely because of the shifting of some cargo via the Suez Canal along with improved trade with Europe. Conversely, he pointed out that even with the disparity in coastal growth rates, he is seeing the West Coast slowly regain market share while being below the 61-39 percent split compared to the East Coast in 2014 and the 63-37 percent split every year between 2008-2013, save for one. In an interview, Hackett explained that while West Coast port operations are beginning to resemble something closer to normal, there are also still some hiccups, too. One example of that, he said, was the recent news that the G6 Alliance, which includes ocean carriers APL, Hapag-Lloyd, Hyundai Merchant Marine, Mitsui O.S.K. Lines, NYK, and Orient Overseas Container Line and serves Europe-ASIA, Transpacific and Transatlantic trade routes while employing 240 vessels and serving more than 60 ports in three major trade lanes, recently canceled four upcoming calls to the Port of Oakland, citing “severe delays” as reported in the Wall Street Journal. Hopefully, the days of port labor disputes are permanently in the rearview mirror as things inch back to normalcy. And with that, it stands to reason that the decline in GDP, due to those events is looked back at as a one-time thing.